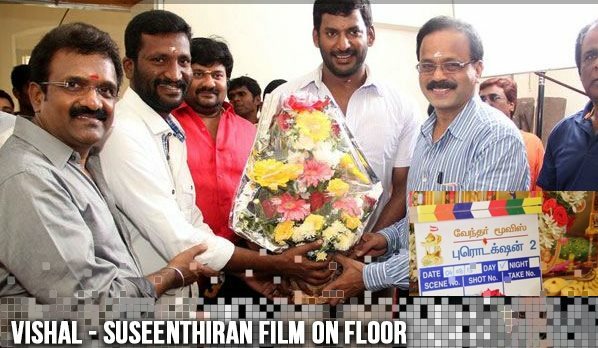 After the success of Pandiya Nadu, Vishal and Suseenthiran have teamed up again for their next film, which went on floors today. The film is yet to be titled. Earlier the team has planned to begin the filming at the end of January, but due to last-minute script delay, the shooting was postponed. Kajal Agarwal is teaming up with Vishal for the first time in this film. Interestingly, Vishal plays a cop in the film. Aishwarya Dutta of Tamiluku En Ondrai Aluthavum fame plays a pivotal role in the film. D.Imman is composing the music. Velraj cranks the camera for this film, while Anthony will take charge at the editing table. The films Naan Sigappu Manithan, Poojai and Aambala in which Vishal donned the lead role did not do well when compared to Pandiya Naadu. Because of this Vishal is more careful in his new film. Vishal starrers Paththu Yaanai, Samar and Vedi which was released before Pandiya Naadu were also not successful. The film Pandiya Naadu only stabilized his career. So Vishal is keen to bring back the success and is working hard for it. In May 2015, he will be working with Lingusamy for his next film ‘Sandakozhi -2’.